She’s a trendsetter! This beautiful friend arrived to school one morning and asked if she could read to the class. How could I possibly say no? 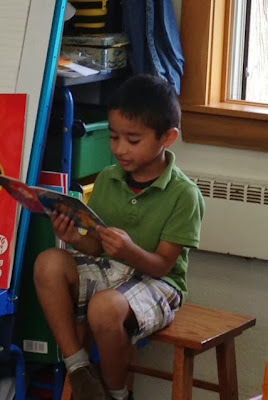 We had been in school just 17 days, and already a class mate was asking to read to her friends…wow! When I announced we had a guest reader during snack/read-aloud time, most of the students looked toward our classroom door, expecting one of our second grade friends. 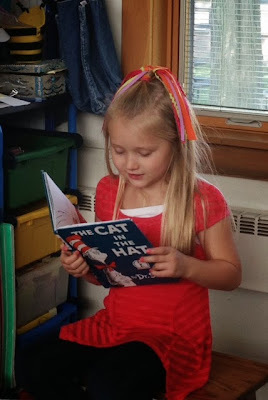 When she got up to get her book and then, moved to sit in the teacher chair, all of her friends were thrilled! That very afternoon, this young man asked if he could read to the class the next day. As soon as I said yes, a handful of students asked to read during snack/read-aloud. Their excitement led to a new classroom routine. Now, our daily line leader (junior teacher) has another responsibility – read to the class during snack/read-aloud, thanks to our courageous first grade friend who asked to read to the class.